The ACTion Drummers performed at the local donut shop for Fat Tuesday festivities and to encourage others to join their drumming community. Artists Creating Together is a non-profit arts organization that empowers individuals with disabilities to learn, grow, and celebrate through the arts. ACT programs span all art genres from dance, music, and drama to all visual art forms. Annually, ACT helps over 6,000 individuals celebrate, succeed, and grow through art. ACT programs can be found in schools, hospitals and other community venues throughout West Michigan. ACT has been serving the people of our communities since 1986. The ACTion Drummers invite the audience up. Look at those smiles! On Tuesday, February 9th, Marge’s Donut Den was bustling with excitement—at least fifty people were crammed into the bakery, chattering amongst themselves about whether they would get fruit-filled, cream, or traditional paczkis. This chatter wasn’t just because of the bakery’s paczki donut tradition for Fat Tuesday, it was also filled with Artists Creating Together musicians and supporters, looking expectantly towards the performance area. ACTion Drummers brought together people of all ages, interests, and abilities in celebration of diversity for Mardi Gras. 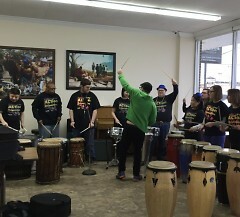 ACTion Drummers is ACT’s longest running adult program and is offered all year. The class is led by Josh Dunigan, an ACT teaching artist who works with ACT’s youth residency programs and Festival Day, in addition to ACTion Drummers. The ACTion Drummers work with a variety of drums, including congas, snares, bass drums and other percussive instruments. They spend weeks preparing music, learning to coordinate with each other, and becoming independent. 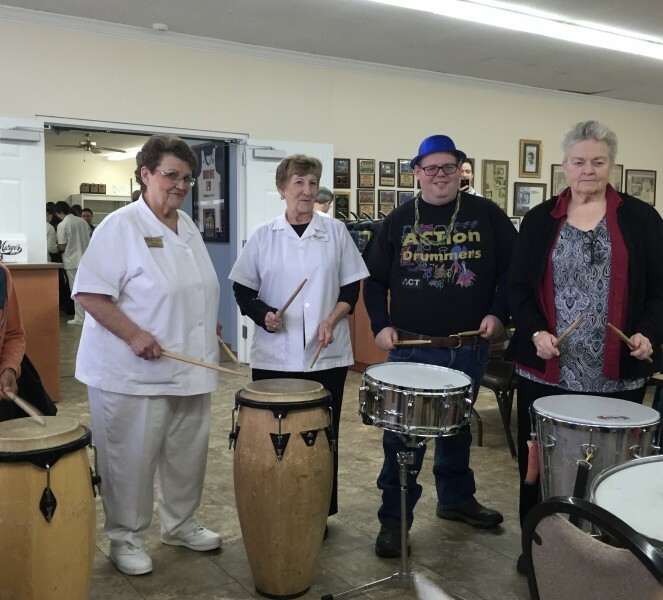 Their Mardi Gras performance was just one example of ACTion Drummers making waves in the community. At the start of the performance, Josh Dunigan clicks his drumsticks loudly to a beat, calling eyes from all over the bakery to the drummers. After four beats, the ACTion Drummers begin a cadence—quick, and loud, the cadence surrounds the entire bakery and the room seems to brighten. The music builds, drummers pick up speed and crescendo, before the musicians stop abruptly and shout, “We. Are. The ACT-ion Drum-mers” followed by one final cadence. Immediately, the audience claps, and the early Tuesday morning seems to have become brighter. People who may have just been there for paczki donuts begin to trickle into the seating area to watch. Soon, there is not an empty seat in sight, and people begin standing and crowding around. The ACTion Drummers play the songs they have spent weeks performing, their hard work bringing joy to the West Michigan community. At the end of their songs, they invite the audience to become ACTion Drummers, and there are not enough drums for the people who want to participate. Marge Wilson, owner of the bakery, even joined in to create music with the drummers. 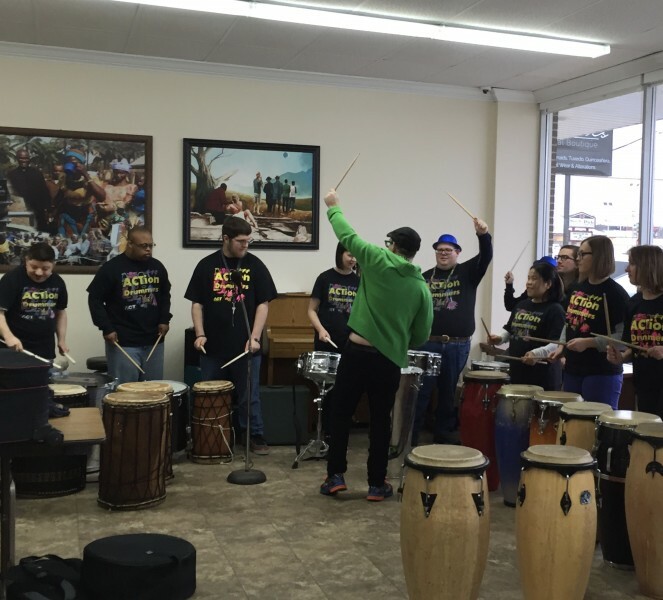 Drumming has been proven to develop a wide range of abilities, making it a crucial art form for artists with disabilities. For example, students who need to coordinate their music with those around them are better able to understand complex situations and see how smaller parts work to create a whole. 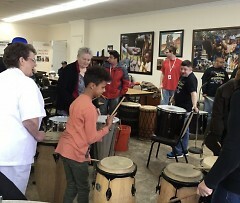 Students who learn to balance rhythms and beats with a larger group of musicians gain bodily control. Above all, however, drumming gives students confidence—it shows them that they are part of the creation of something bigger, and their involvement is important to the creation of music. This is the goal of the ACTion Drummers, and the program has been constantly expanding. Starting mid-April, ACT will be starting a new ACTion Drummers session, open to artists ages 16 and up with disabilities. With information about registering, emailing [email protected] or call 616-885-5866 with questions. For more information about ACT’s adult programs, visit our website.